With these creative ideas for repurposing paint switches, you can turn project leftovers into bright, bold, and lasting home accents. You agonized over choosing precisely the right color to paint the spare room. As part of your effort (and partly because they looked pretty), you picked up plenty of paint chips from the local home improvement store. Though you’ve now put the brushes away and the paint project behind you, the DIYing doesn’t have to stop there. Rather than let all those paint chips hog space in a drawer, scroll down to see five favorite ways of putting them to practical or decorative use in the home. 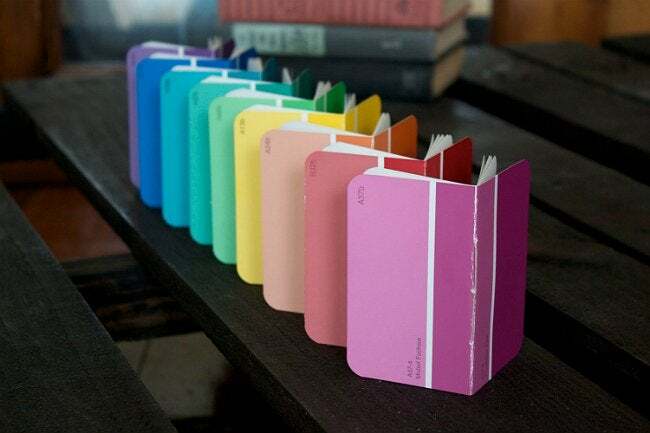 Record your thoughts on mini notebook pages bound within a paint chip from your favorite color family. To make, line up a paint chip with several sheets of cut-to-size looseleaf. Once aligned, fold the materials in half and staple down the middle crease. Finally, place the notebook under a heavy object to help the fold set. Paint chips provide the burst of color ideal for a clever wall hanging like this one from Kollabora. Cut select paint chips into circles of different sizes, then tape them an inch or two apart along a series of strings. 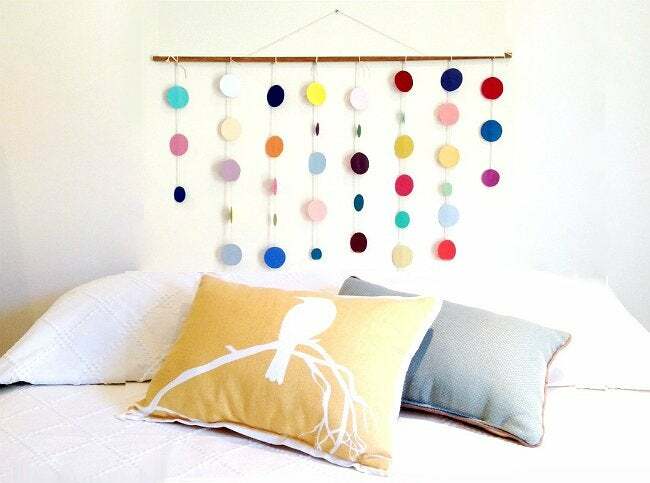 Tied to a wooden dowel, the strings hang down to create a whimsical grown-up twist on traditional children’s mobiles. 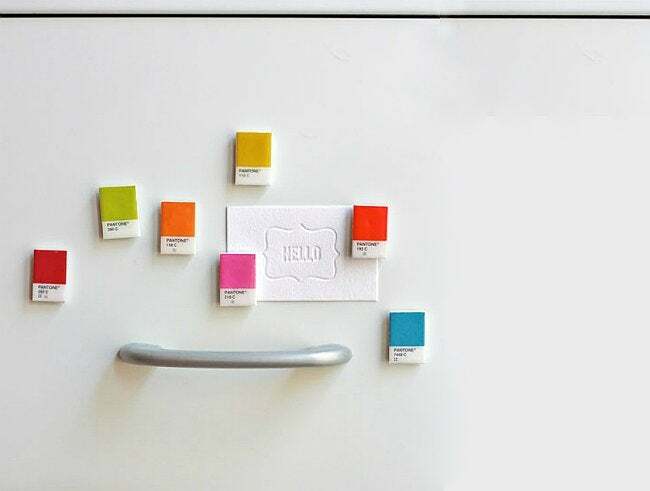 From How About Orange, here’s a creative way to turn paint chips, Pantone or not, into eye-catching fridge magnets. After gluing your favorite chips to thick bookboard cut-outs, apply paper glaze to lend each one a finishing shine. Last, attach self-adhesive magnets to the rear sides, and you’re ready to stick ’em up! Call off the search for the perfect wall calendar! Using this method from Say Yes, you can create your own agenda—easily—month after month. 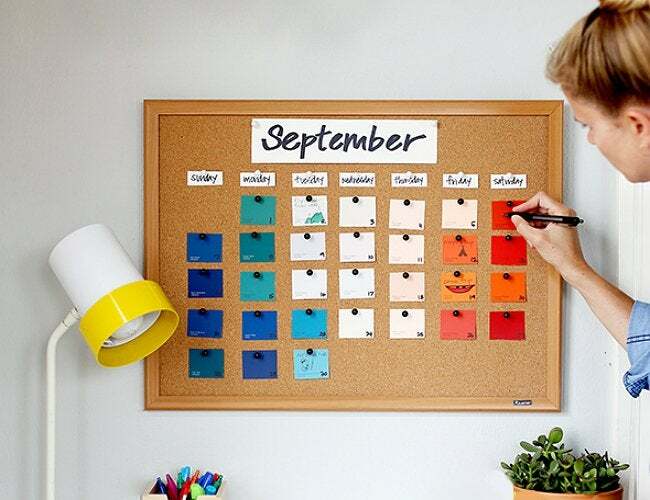 Simply date each paint chip you plan to use, then pin them all up in orderly columns. With the month declared at the top, each column falls under a label for a certain day of the week. 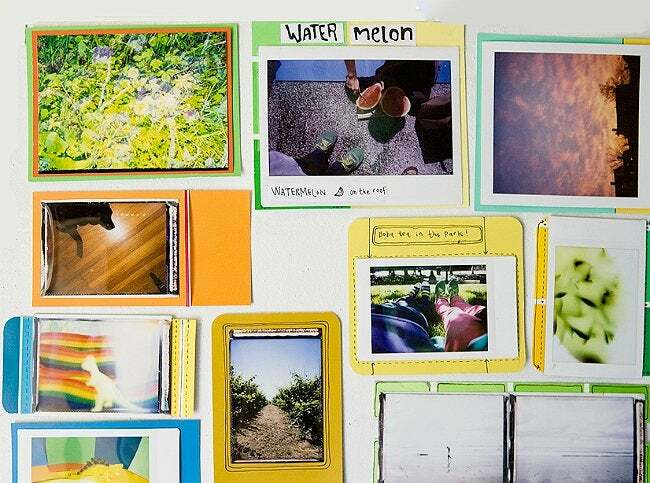 Put larger paint chips to work as colorful background mats for printed photographs, says Photojojo. Just use tape or glue to adhere your photos to the swatches, trimming down either as needed. Then reach for a Sharpie and, wherever the image does not fill the frame, annotate with dates, names, doodles, or quotations.